Every few months, the Nile Scribes bring you summaries of the latest news and discoveries in Egyptology, both from the field and the lab. We’ll introduce you to the newest archaeological finds or recently undusted manuscripts being rediscovered in museum collections, plus other new theories stirring in the Egyptological Zeitgeist. In this issue, we draw your attention to two major finds associated with a late Old Kingdom queen, plus further discoveries in Alexandria in underwater archaeology. The Egyptian Ministry of Antiquities publishes a very helpful round-up of recent discoveries, events, and projects in Egypt in an accessible PDF format. The latest issue was published in October 2017 (version: English or Arabic). 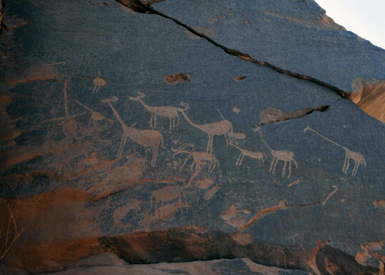 Nile Scribes: An exciting discovery was made just south of Aswan in the Subeira Valley. Scenes with various animals such as hippopotami, bulls, and donkeys decorate the wall and areas with tool production were also found near the site. NS: A pyramidion was a pyramidal-shaped stone, which would be placed at the very top of a pyramid. This one was discovered at Saqqara and is attributed to the pyramid of Queen Ankhnespepy II – more on another discovery to do with her below. See also “Ancient Egyptian Pyramidion found next to Largest Obelisk hints at Existence at Queen’s Lost Chamber” published in Newsweek on October 13, 2017. 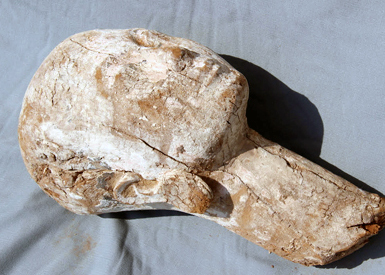 NS: An archaeological mission recently made an intriguing find in Saqqara: the head of a wooden statue of what appears to be a late Old Kingdom queen. In looking at the artistic style of the head, some specialists have expressed doubts regarding its date: does it perhaps date to the early New Kingdom? We await further investigation. NS: At ancient Philoteris, a third century B.C. Greek village in the Fayoum, a German and Egyptian archaeological mission has discovered a Hellenistic gymnasium that was used by the Greek population as a place for men to be schooled in sports, literature, and philosophy. The gymnasium complex at Philoteris consisted of a large meeting hall, dining hall, race-track, and gardens. 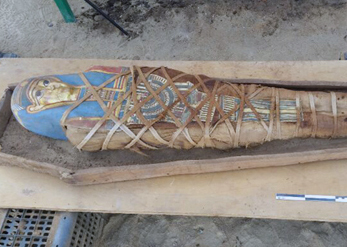 NS: A well-preserved mummy was found in a wooden sarcophagus in the Fayoum basin. While some cartonnage from the face mask as well as some decoration remain, the wooden sarcophagus is in a fragmentary condition. The cemetery where the mummy was found, is renown for its Coptic and Islamic burials, though also contained burials from Graeco-Roman times. 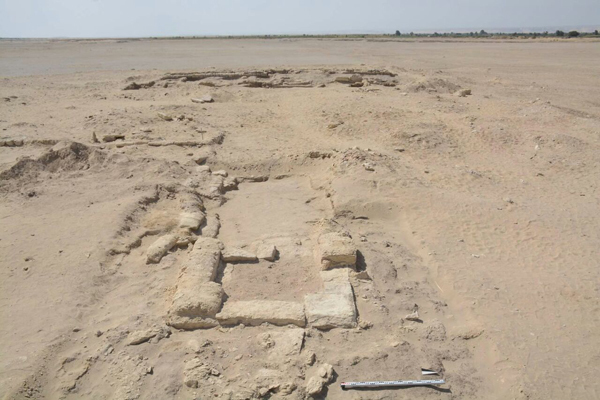 NS: An intriguing discovery was made just north of Cairo in Banha as part of a residential construction project: the remains of a temple to Isis was found and the MoA sent a team of archaeologists to investigate. We look forward to hearing more about this exciting find. NS: Underwater archaeology is a field often associated with Alexandria due to many antiquities lying beneath the water, as the shoreline has moved further and further inland over time. While the photo used in the article is in regard to an exhibit that was recently held in the British Museum, three vessels with a hoard of objects were discovered by an Egyptian team in the port of Alexandria – the finds date to Roman times.